A question was asked in this thread on the APEX forums that got me itching to do a science experiment. After looking at the individual option there, I chose to work with Gritter for a number of reasons. I liked the look and feel of it’s output. To me it felt the most like what I am used to seeing from Growl. It pushes most of the heavy lifting back onto jQuery, where it should be, and the author doesn’t try to over engineer the solution. You can choose what ever library you wish, but in this example I’ll be using Gritter. The next thing to do is to include these scripts into your application. I wanted to see if I could completely replace the standard way APEX handles SUCCESS and FAILURE messages, so I want these scripts to be available on every page. There are two ways I could do this: I could create an After Header region on Page Zero that loads the scripts, or I could edit the page template and insert the script calls there. To alter the template, navigate to the shared components for the application, click on Templates and edit the page template that you’re using throughout your application. In most cases there will probably only be one template that you’re using, but for more complex applications there may be 2 or 3 you need to edit. You really only need to edit the templates that are used on pages you want to use the growl notification. In my case, there was just one. Once you edit the template, you’ll need to scroll down to the Subtemplate region. This is where the Success Message and and the Notification (Fail) message templates are defined. 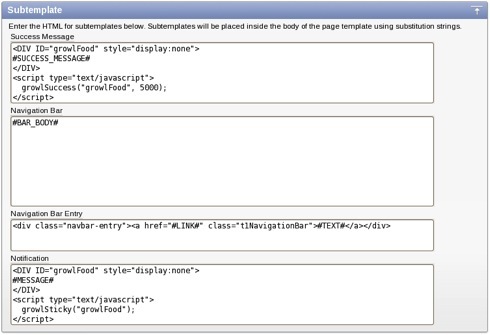 In the Picture below you’ll see the code in both regions that replaced the original code included in the template. In both cases, the first thing the code does is create a DIV, giving it an ID that we can grab ahold of later and sets its CSS style to “display:non”. This will keep the DIV from displaying until the Gritter script styles it. The contents of the DIV is the appropriate message template replacement variable, #SUCCESS_MESSAGE# and #MESSAGE#. And the code in this region is as follows. // Instantiate the gritter message. This is the definition of the two functions that we called in the template code. The comments in the code should document what it’s doing fairly well. But the main thing to understand are is the call to gritter.add. This is the “magic” code that creates the Gritter “floating message”. Referencing the Gritter documentation, you’ll see that there are quite a number of options that I’m not using. I wanted to keep things fairly simple just to make sure I wasn’t fighting against complexity in the early stages. I did go an extra step and put an image inside the sticky message type that is used for Notifications, to differentiate it from the Success Message. EDIT (6/24/11) – Patrick Wolfe, completely independently, has created a Dynamic Action plugin that does much the same thing (see the demo here). The reason I went down this path is because the DA Plugin isn’t easily implemented for the APEX Success and Failure message. Anyway. Interesting that two people solved a strikingly similar problem and came up with much the same solution! Thanks very much for your Growl style notification blog. I like your idea and love to implement in my appliaction. I have tried impementing the solution as you mentioned in your blog but I can't see any growl. I have used — href="WORKSPACE_IMAGES#jquery.gritter.css" and src="WORKSPACE_IMAGES#jquery.gritter.min.js" on page zero as my application is on oracle apex hosted site. Can you please help me to sort out this issue? If the code that you put in your comment is directly cut and pasted from your app, then you're missing the beginning # . It should read. Great Idea, can you give us idea but using pluggin notification, it is loaded into app so, it has a js files. Is Possible? How wil be? You'll see the NOTIFICATION plugin that does something that is VERY Similar to what I blogged about.